This year, during the Cultural Olympiad that will be going on in London, every single one of Shakespeare’s plays will be performed and each will be spoken in a different language. All over the planet, Shakespeare is acknowledged not only as the greatest playwright in English but also as someone whose work means something to the people of every country in the world. To say that he is ‘universal’ has become a cliché but like a lot of clichés, it’s no more than the truth. We don’t know an enormous amount about him. Unlike Dickens, for instance, or Jane Austen, he did not leave behind letters or documents to help us. But certain facts are known. He married Anne Hathaway. He was an actor. His patron was the Earl of Southampton. He was a contemporary of Ben Jonson and Kit Marlowe. He was the son of a glovemaker. Jude Morgan’s supremely accomplished and original novel makes it clear also that he was an enigma; that even in his lifetime, no one quite understood how it was that he transcended so completely every single one of his peers and (did they but know it) every other playwright who would ever put pen to paper. This book, which doesn’t appear in the shops till April 12th, is a revelation. The first thing to say is this: at no point do you feel wrenched out of the comfort zone of modern life and thrust into a fusty, musty, olde-worlde England where you’re not sure what’s going on and where everyone speaks oddly. There is no pish-tushery here. 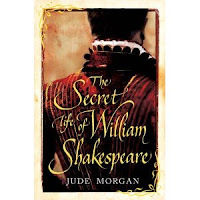 The novel follows young Will from Stratford, to London and also follows, in two more parallel narratives, Anne left behind in Stratford with the children and Ben Jonson, struggling to learn and write while apprenticed to his step-father as a bricklayer. Morgan is adept at giving a shape and meaning to lives and talents we find it hard to grasp. His novel A Taste of Sorrow brought the Bronte family to life in an extraordinarily moving way and here, his great achievement is to have fleshed out the facts we know in such a way that we are there, with the protagonists, sharing their fortunes, their setbacks, their personal tragedies and above all, the separate stories of their relationships. This is the best thing about the book: the fact that Will, though its hero, acts mostly as a mysterious centre of other people’s stories. There is scarcely any quotation from his work. There’s no trite scene where we see him chewing the end of his quill while struggling to find words. Only a few of the plays are alluded to. Rather Morgan has made the writing almost the ‘secret life’ of the title: something that happens, something he does, away from the main action of the novel. We are aware of it going on off-stage and our main focus is on Will’s personal life, his friendships, his heartaches, his love for his wife, through everything that happens to them both. Will has always been aware of the power of what he can do. From childhood when he followed the players who came to perform in the town, he’s understood plays. He knows the repertoire backwards. He knows the parts by heart. And he realizes that it’s all done with words. “And what those words must do: from the moment the play begins, they must make everything: the earth and sky and the people who move there. A soldier’s breastplate, a painted throne –these tawdry bits and pieces are the only aid the words can call on. First, words. First and last, words. He wants to make it with words. He wants to try it. He doesn’t think it’s his destiny - it’s necessary to be clear about that. But still, there is a gathering. Droplets must gather to make a storm." This is a beautifully structured, perfectly written book which is moving because it brings out the human story of an almost supernaturally gifted writer. Anyone who already loves Shakespeare will find it compelling and fascinating and for those who still have to discover him, this novel is an ideal way of approaching him. There’s a point in the book when Will is comparing himself with Marlowe and Jonson. This is what he thinks, and it sums up his genius exactly. This is no more than the truth. Morgan puts it very well: the whole of the universe and everything in it is balanced on the end of William Shakespeare's pen. Wow! I must read this. It will be worth it for that quotation about A MIDSUMMER NIGHT'S DREAM alone. I loved the Bronte book - after not expecting to. He really is an extraordinary writer. How wonderful, to be honest enough to keep the mystery of Shakespeare's genius AS a mystery - and how assured and brave, too. I must get hold of this. Thanks for all the comments! Yes, it's a lovely book and the Bronte one is just as good. Clever man. Should be much better known. He wrote one on the Romantics as well. Really looking forward to this one!